This week at The MMQB is dedicated to the life and career of Paul Zimmerman, who earned the nickname Dr. Z for his groundbreaking analytical approach to the coverage of pro football. For more from Dr. Z Week, click here. This story originally appeared in the July 30, 1984, issue of Sports Illustrated. The painting hangs on the wall outside the office of Art Rooney Jr., the coordinator of the Pittsburgh Steelers’ scouting operations. It’s not the kind of thing you’d want your mother or your wife to see. It’s what Attila must have looked like while he was sacking a village, or the way a Viking chieftain was with his blood lust up. Only this Viking wears No. 58 and he’s dressed out in the gold and black of the Steelers, eyes flashing in a maniacal frenzy; blood flecking his nose; his mouth, minus three front teeth, bared in a hideous leer. Jack Lambert’s portrait epitomizes the viciousness and cruelty of our national game. The portrait was done by Merv Corning. It was one of two he submitted to the Steelers’ publicity director, Joe Gordon, for possible use as a program cover, and it was rejected immediately. Too scary. Rooney saw it. He called Corning. “Can I buy the original?” he said. The deal was made, and Rooney hung it outside his office. Then he had misgivings. “I thought, ‘Holy hell, Lambert’s gonna pull this thing off the wall when he sees it,’ ” Rooney says. So he removed it and sent for Lambert. Is that really the image Lambert wants, a toothless monster ravaging the NFL? Off the field he’s a quiet, extremely private man, a bird watcher and avid fisherman. A bachelor, he owns a house in the exclusive Fox Chapel suburb of Pittsburgh, and he spent much of the off-season ensuring greater privacy by building himself a country retreat on 85 acres he bought about 40 miles northeast of the city. At one time he was bothered by all the Count Dracula-Darth Vader stuff everyone used to write about him. When the Steelers played the Rams in the ’80 Super Bowl, Jim Murray, the columnist for the Los Angeles Times, referred to him as “the pro from Pittsburgh, Transylvania.” That same year the Steelers’ highlight film called him “Count Dracula in cleats.” In 1981 Azra Records of L.A. put out a platter in the shape of a football; it was called “Mad Man Jack,” and two bass drums pounding all the way were supposed to simulate Lambert’s feet pumping before a play, a trademark of his early pro days. But here’s Lambert, carefully scrutinizing that savage picture in the Steelers’ office and deciding, “Yep, that’s me, all right.” How come? As Jack Lambert reported to camp last week for his 11th Steelers season, he still seemed larger than life. He came to the Steelers a tough, skinny kid out of Kent State, and he found a spot on a team that was just reaching the crest of its greatness. He arrived at exactly the right time, in exactly the right place. Pittsburgh fans have always appreciated talented athletes, but they reserve a special place in their hearts for their tough guys—Fran Rogel, Ernie Stautner, John Henry Johnson, those people. And Lambert played the ultimate tough-guy position, middle linebacker. At one time middle linebackers roamed the league like Goliaths. Nitschke, Butkus, Schmidt—names as tough as the people who carried them. Willie Lanier, with that pad he wore on the front of his helmet. Mike Curtis, the Animal. Bob Griese talks about staring across the line at Butkus and feeling his legs turn to jelly. Gene Upshaw, the Raiders’ ex-guard, remembers the terror he felt when he looked into Lanier’s eyes. But then a few years ago something sad happened to these great middle linebackers. The 3-4 defense robbed them of their identity. They divided, like an amoeba. Instead of one, there were two of them, inside strong and inside weak, or, in the Steelers’ case, left and right. The great gunfighters of the past had gone corporate. It was as if Wyatt Earp had taken on a job with Pinkerton’s, or Bat Masterson had become director of security for the First National Bank. It happened to Harry Carson with the Giants, then to Jack Reynolds when he went from the Rams to the 49ers. And then the last of them, the last of the great old middle linebackers, Jack Lambert, got his two years ago. “Oh yes, Mr. Lambert, I’ve heard of you. And what position do you play, Mr. Lambert?” And instead of snarling out “middle linebacker” through chipped and broken teeth, Lambert would answer “inside linebacker left.” Sounds like a traffic signal. Oh, there are still middle linebackers—seven of them. They belong to the seven NFL teams that continue to use the 4-3 as their basic defense, but most of them are 60% players. They get the hook on passing downs, when the defense goes into its nickel. There’s the Bears’ Mike Singletary, the best of the bunch, but the rest of the names won’t quicken the pulse: Ken Fantetti, David Ahrens, Neal Olkewicz, Bob Crable, Bob Breunig, Fulton Kuykendall—all good steady workers, but there’s no magic there. So can you blame Lambert for trying to recapture a little of the old imagery, some of the old glamour—and terror—that went with the position? Actually, if you look at Lambert’s career with the Steelers you find a remarkable collection of big plays in big situations, but no trail of bloodied and broken bodies; you find very little to justify all the adjectives of mayhem that give writers so many easy off-day features. Lambert hits hard, of course. Always has, ever since his high school days. As for the missing front teeth, they were the victims not of the thundering hooves of Pete Johnson or Earl Campbell, but of the head of Steve Poling, a high school basketball teammate. Poling’s head collided with Lambert’s mouth in practice one afternoon. Lambert’s fourth Super Bowl ring came against the Rams in January 1980. Then there are the feet, the way he’d pump them up and down before the ball was snapped, a picture of intensity. He got away from that after his first few years. Four incidents, fairly evenly spaced, helped nurture and feed the Lambert image. First there was the Cliff Harris affair in the Super Bowl after the ’75 season, Lambert’s second year. In the third quarter the Steelers’ Roy Gerela missed a 33-yard field goal. Harris, the Cowboys’ free safety, tapped Gerela on the helmet and said, “Way to go.” Lambert flung Harris to the ground. No flag was thrown, but referee Norm Schachter was on the verge of kicking Lambert out of the game. Lambert talked him out of it. Then there were the three Brian Sipe incidents, during the ’78, ’81 and ’83 seasons, three set pieces from the same script. Each time Lambert hit the Cleveland quarterback as he was releasing the ball. Too late, decided the referee, who was Ben Dreith the last two times. Each time Lambert got mobbed by the Browns’ bench, each time he was flagged, and twice he was ejected from the game and fined by the league. After the ’78 hit he spent 20 minutes in Pete Rozelle’s office. Lambert explained that he had crossed both arms in front of him to soften the blow. The hit was still late, Rozelle said. In the dressing room after the ’81 game, the writers asked Lambert about the play. “Dreith said I hit Sipe too hard,” Lambert said. And that’s basically it. Four incidents. And the image grew, fed on itself, took hold. Sometimes Lambert helped it along. Though he never got much beyond his college playing weight of 217, Lambert tackled as fiercely and efficiently as anyone who’s played the game. Russell, a successful businessman in Pittsburgh these days, shakes his head when asked about the Lambert image. The image. Close your eyes and you can see Lambert ranging from sideline to sideline in the old 4-3 days, a big wingless bird, half an inch over 6'4", barely 220 pounds, always squared up to the line, always around the ball. He has made the Pro Bowl in nine of his 10 years and leads active players for appearances. He missed out only in his rookie season. He has led the Steelers in tackles all 10. They didn’t keep stats for tackles and assists in the old days, but he probably has more than any Steeler ever. The Hall of Fame is certainly in his future, but he’ll have to wait his turn. Jack Ham, Joe Greene and Terry Bradshaw, his teammates from Pittsburgh’s Super Bowl era, will probably get in before him. And he’ll most likely still be active when Franco Harris has retired to begin his five-year wait for enshrinement. “You have to understand this area,” says Bill Cox, Lambert’s old basketball coach. “Those 6'7", 260-pound high school football players you hear about, you just don’t see ’em around here. When Jack played there was a 6'8" center on the basketball team named Denver Belknap, and he was the freak of northeast Ohio. Jack was 6'3½" in his senior year, and I don’t think Crestwood’s had anyone much taller since. From his mother, who’s 5'8", Lambert got his height; from his father, now a plumbing estimator in Cleveland, his square and exaggeratedly wide shoulders. Lambert’s mother pulls out a sixth-grade class picture from Shalersville (Ohio) Public School, where she and Jack Lambert Sr., were classmates. Jack Sr. is in the front row, a blond, wide-shouldered little boy with the same tight-lipped, slightly sardonic smile that marks Jack Jr. It was his father’s side of the family that also supplied Lambert with toughness, or at least a good share of it. “My father’s dad played a little neighborhood football in Cleveland,” Lambert says. “I’ve got a picture of him in his old leather helmet on the wall of my study. But he was best known for his boxing. He fought under the name of Johnny Lemons because his mother didn’t want him to fight. They tell me he once fought Johnny Risko in Cleveland, even though he was little more than a middleweight and Risko was a heavy. When Lambert was two years old his parents were divorced. He’d spend weekends with his father. Most of the time they’d play ball. A few years ago Jim O’Brien of The Pittsburgh Press asked Lambert if his parents’ divorce had affected him in any way. At Crestwood, where Lambert was a catcher and lettered for four years, they said that he had a great future in baseball and that he was good enough at basketball to play in college. But his first love was always football. Lambert also remembers going up to his football coach after his freshman year and asking to get his number changed to 00. “He told me, ‘If you want to wear a special number, you’ve got to be a special player,’ ” Lambert says. He got the number after his sophomore season, and it’s since been retired, along with the 99 he wore at Kent State, giving him a record for range of retired numbers that will never be broken unless they go into three digits. By his junior year he had begun to shoot up, and as a 6'3½", 170-pound senior he became a dominating force—in all his sports. “He averaged 17.9 points and 13 rebounds in basketball,” Cox says. “People say, ‘Wow, Jack Lambert on a basketball court, he must have sent bodies flying,’ but he wasn’t like that. He was smart, technically very sound. He always knew what had to be done. In his senior year Kent Roosevelt High had a 6'5" kid named Andy Steigmeier who later made All-State and played for Ohio State, a real cocky kid. Before the game Jack said to me, ‘Can I guard him?’ Jack got four fouls on him at halftime, and the kid fouled out early in the second half and we won by a point. In football Lambert played quarterback (“Handed the ball off mostly,” he says) and on defense he made all league as a weakside cornerback—squirmback, they called it at Crestwood. “He was my fourth-fastest of four starting defensive backs,” Myers says. “He didn’t get his speed till he got to college, but no one ever completed anything deep over him. His first step was always correct. He always knew the angles. And God, would he hit ’em. First they stopped throwing curls in front of him, then they just stopped throwing to the split end in general. Myers, who’d played tight end and captained his team at Miami of Ohio, tried to get Lambert into his old school. Miami’s coach was Bill Mallory. He told Myers that Lambert was too slow to play the secondary in college; maybe, if he got up around 220, he’d be a defensive end someday, but not at Miami. “I told Mallory, ‘You’d better hope he goes outside the Mid-America Conference,’ ” Myers says, “ ‘because someday he’s gonna come back and beat you.’ He did, too, his junior year at Kent. Beat ’em on a goal-line stand. He made four straight tackles inside the two. Cox finally swung the deal for him at Kent State. Lambert manning the middle vs. the Cowboys in Super Bowl X. Don James took over as Kent State coach in Lambert’s sophomore year and, with three games left in the season, moved him to middle linebacker in the 4-3. But he was due to go back to defensive end as a junior. The Kent State press book for Lambert’s sophomore season had included the prophetic words “lust for contact” in his bio, and by the end of his junior year the publicity department was listing his tackles and assists in its weekly mailings—19 and five against Miami, 15 and six against San Diego State. That year Lambert was voted MAC Defensive Player of the Year and MVP of the Tangerine Bowl, despite the presence of Tampa’s John Matuszak, the first player drafted by the NFL that spring. The pros had a book on him, also some questions. Where do you play a skinny 6'4½" kid? “My cousin Timmy, who’s head of personnel for the Lions now, was the guy most in his corner,” Rooney says. “He told me that the day he was up at Kent they had a quarterback who was evidently a dissipater, and he did something and they were going to throw him off the team. Lambert was the captain. He went up to Fitzgerald and said, ‘You can’t. You’ll wreck the team.’ Fitzgerald said, ‘O.K., but he’ll have to run a punishment drill.’ Lambert said, ‘I’ll run with him to make sure he does it.’ Lambert ended up dragging him through. The Steelers drafted him with time running out for their second-round pick. It had been between Lambert and UCLA linebacker Cal Peterson, who wound up in Dallas. Lambert was happy to go to a place only a 2½-hour drive away, but there was a problem. What position was he going to play? The left linebacker, Ham, was just emerging as a superstar. Russell, on the right side, had played in four straight Pro Bowls, and Henry Davis, the 235-pound middle linebacker, had been a Pro Bowler two years before. Lambert began driving to the Steelers’ office every weekend to watch films. That was a strike year, 1974. Lambert got an extra-long look in camp. So did Mike Webster and Lynn Swann and John Stallworth, and a free agent named Donnie Shell. All of them wound, up as Pro Bowlers. The veterans returned, and Lambert backed up Ham for a while, but in the next-to-last exhibition game Davis went down with a nerve injury in his neck, and Lambert was thrown in the middle. In terms of defensive talent there has probably never been anything to match the Steelers’ first two Super Bowl champions, the ’74 and ’75 teams. In the Pro Bowl following the ’75 season, seven Steelers were on the starting AFC team, including all three linebackers. Another Steeler was a backup, another had made it earlier and another, Shell, was a future. That’s 10 defensive Steelers with Pro Bowl credentials on one squad. Lambert (58) had Kwalick (89) covered on the final play of the AFC title game in January 1976. 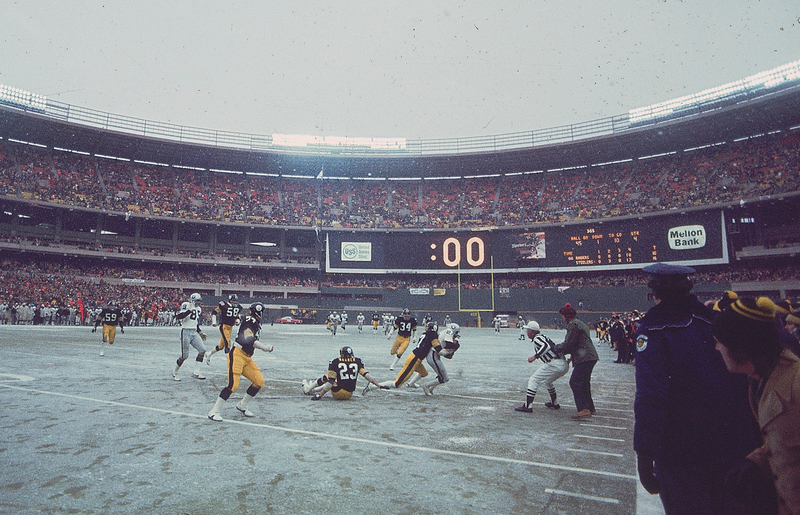 In ’76 the Steelers were beaten by Oakland for the AFC championship when a plague of injuries hit their running backs. In ’77 they lost to Denver in the playoffs. Lambert had missed three games with a knee injury. He’d been a 39-day holdout in camp, over contract matters. A few people partly blamed the demise of the Steelers on him. He didn’t take it kindly. Eventually he signed a five-year contract for a reported $1.25 million, making him the highest-paid defensive player in the game. The ‘78 and ’79 Steeler teams won two more Super Bowls. Lambert was still a young player, but by now he’d picked up an old-pro image, hard-bitten, no time for chitchat. In ’77 Houston had beaten Cincinnati to allow the Steelers to back into the playoffs, and a day before Pittsburgh’s first-round game Joe Greene announced that in appreciation the Steelers were sending each Oiler player an attaché case. Lambert threw his helmet into his locker in disgust. The week before the Super Bowl in Pasadena in 1980 was a downer. Winter rains had turned the practice field heavy and soggy, deadening the legs. The team had an air of defeat about it. One day after practice Lambert and a couple of teammates were having a beer in the Main Brace, the bar in their hotel in Newport Beach. A bunch of teeny-boppers spotted them. The kids in Pittsburgh saw another side of him, though. So did the people who’d get him to make one of his rare banquet appearances—always unpaid. The remnants of the Super Bowl Steeler defenses are dwindling. Last year Ham retired; this year it’s Blount and Loren Toews. Only Lambert and Shell remain. And in 1982 the Steelers gave Lambert a partner at an inside backer spot, going to the 3-4. Jack didn’t like it. He doesn’t leave the field on passing downs. “If I did I’d start looking for another position,” he says. His range on deep coverages is still amazing. Lambert’s mother owned a flower shop. “I’ve met some of the old linebackers,” Lambert says. “Bill George, Sam Huff. Huff has written me a couple of short notes. ‘I saw you play. I think you’re a fine linebacker.’ It was really kind and considerate. I met Ray Nitschke one time and we sat down and talked, about anything and everything. He walks stiff. Most middle linebackers do. Comments, thoughts or memories about Dr. Z? Send them to us at talkback@themmqb.com.